Rescue your peeps (yellow) from the horrible monsters (red) by taking them to the exit (blinking space) ! You can never run out of lives but dying will restart the level. If you find a level too hard just remember that monsters only move in a very specific manner & there are a lot of spaces where they can never reach you. Welcome to MATCHY MATCHY, the puzzle game of animal love. Connect pairs ( or more ) of matching animals to solve puzzles, get points, and make love not war. There are two modes, the relaxed PUZZLE mode and the hectic TIME ATTACK mode. PUZZLE mode - The aim is to try to clear all the pieces form the board so that no animal is left behind. You don't have to clear the entire board to unlock the next level, though. There are 35 levels in total. Can you clear them all? This mode encourages forward thinking and careful planning. Beware of making Love Triangles as this might leave an odd number of animals behind. TIME ATTACK mode - The aim is to play as long as possible and get the highest score. As you play, new pieces are added to the board, faster and faster. If you run out of valid moves, several pieces will get added to the board at once! Also any wrong move will be punished by an extra piece. When you clear enough of the board with no moves left, you will level up. Levelling will generate a new board and slow down the timer a bit. The game is over when you run out of space on the board. This mode encourages quick thinking and changing strategy on the fly. The author deeply regrets that due to gameplay considerations MATCHY MATCHY is not representative of inter-species love. The author acknowledges that love knows no limits and no man, animal, machine, deity or other entity should attempt to impose such limits. 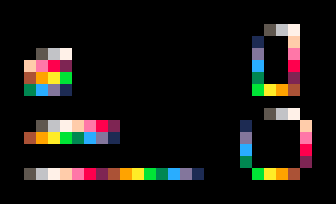 Of course one can get a lot more than 32 colours using this method, but I opted to keep it simple and just use extra 16 colours that are halfway between the default ones. 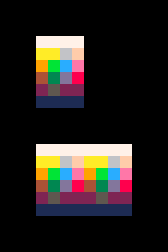 This also made it easier to write a custom export script that would convert a 32 col image to two pico-8 images. My first solo release, made entirely on the train during this week's commute. I spent some time analyzing the palette and came up with some things that I find make it easier to use. I decided to share it here in case others find it useful as well, so here goes. First ting I did was map the colourspace. This makes it very easy to find nearby colours when shading or tinting. The colourspace wraps horizontally thru the spectrum as illustrated by the double width block. Next I reduced the colourspace to use single pixels instead of clusters. Less accurate but more compact. You can use this order regardless of your gfx software fo choice. 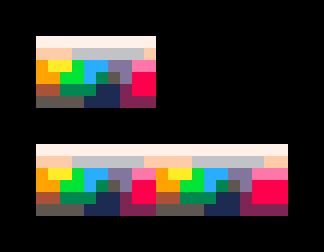 I made sure the palette works whether it's presented in a single row, 2x8 or 4x4. An added bonus is that the this order also wraps around nicely, as illustrated by the 'ring' versions on the right. 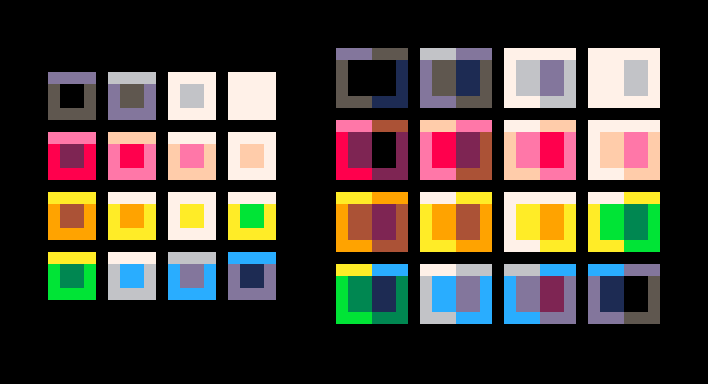 Lastly I set myself a challenge to make 16 'materials', using each of the 16 colours as the base colour. In essence this meant creating 16 colour ramps that all feel different. Of course, my personal artistic choices here might not mirror yours. I found this to be a handy reference when looking for the perfect colour to shade with. Hopefully someone else finds this helpful.